We’ve seen all the holiday movies – Mom’s in the kitchen baking cookies and pies, the house is stylishly decorated, the kids are in matching outfits and all is perfect. It’s on Pinterest every time we turn on the app. We ooh and ahhh over the latest holiday decorations, amazing recipes fit for a restaurant and homemade crafts perfect for gifting. Yep, I’m guilty of planning a Pinterest Perfect Holiday Season and there have been a few years I’ve been guilty of attempting to execute it. Notice in the above sentence I said “planning” and “attempting.” That’s as close as I’ve ever gotten to a perfect holiday season. This year, I’m challenging myself to something different. I’m throwing out the amazingly high expectations I set for myself and letting myself just experience the holidays with my family. After all, my fondest memories of holidays growing up are about family, togetherness, and laughter. Quick – close your eyes and conjure up your best Thanksgiving and Christmas memories. Are they about how nice the decoration were, receiving the gift you’d always wanted or eating food fit for a five star restaurant? Not once can I remember how a table was set at the holidays, or how stylish the house was decorated or really if the food was even good. There are a few great gifts that make me smile but then I remember the fun we had opening them on Christmas morning. Waiting for Dad to get his cameras set up, sitting on that bright blue carpet with Shelly and our brother in the glow of the colored twinkle lights, and mom smiling through it all. It really wasn’t so much about the gift. Even into our teen and young adult years it was about hanging out together. We recently watched a video of Christmas from my college years. Wow, was it funny and I don’t just mean the 90’s styles. 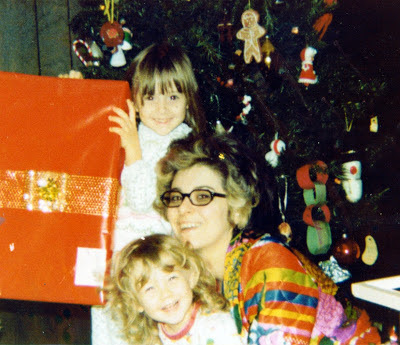 All of us, Shelly, our brother, our parents and I were just having a good time laughing and messing with each other. The best part about watching was realizing we haven’t really changed all that much. Obviously some of us have aged a bit in 20 years and the hairstyles are thankfully different, but it was just so us, us together as a family. And now we are all married with kids but still get together in a loud and crazy, chaotic way that makes me smile. These consistent memories are what I want to capture for my family this holiday season. How do you make the Perfect Pinterest Holiday Season? In my book, it’s about creating simple, warm memories that stick with you to make you smile 20, 30 or 40 years later. 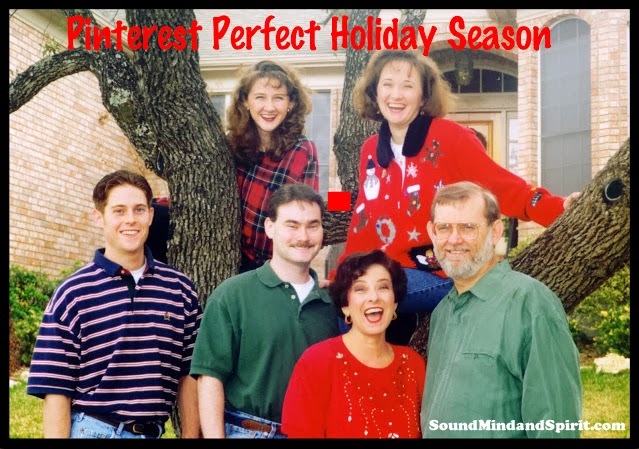 The Perfect Pinterest Holiday Season pin should be a picture of a family together smiling. Much like the one of ours hanging out in a tree 15 years ago. It's our 1997 Christmas Card. Tell me that picture doesn't make you smile! Shake off that Pinterest Perfect! Will you join me in giving yourself a break this holiday season? Simplify the holidays and focus on creating important memories for your family. This year, make the holiday season simply perfect with laughter and family togetherness.